Started 12/22/13: I did a little maintenance on my Singer 301a machine and couldn’t resist the temptation to sew. 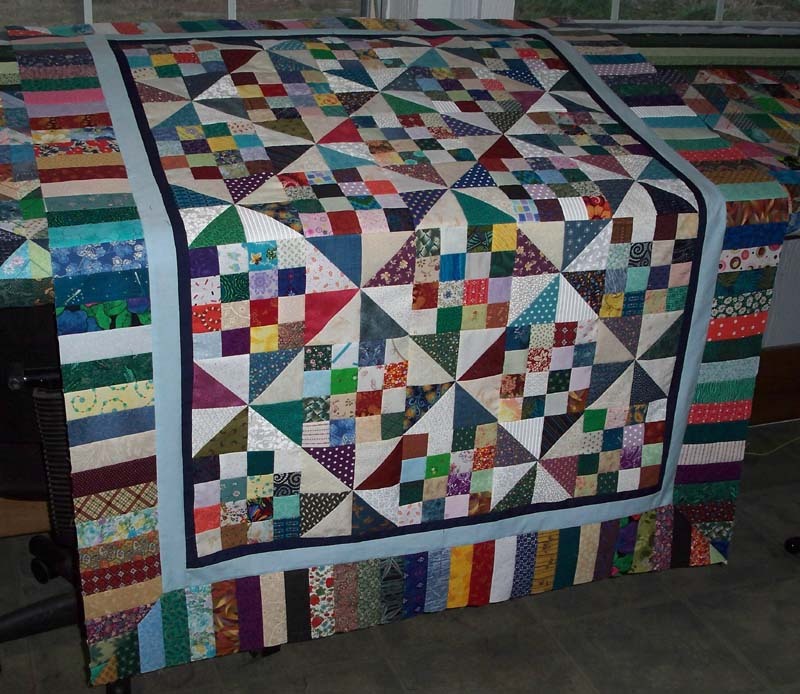 I enjoyed making the Log Cabin Sofa Quilt so much, I decided to cut, machine piece and possibly machine quilt another small quilt. This one may be a baby-sized quilt. One never knows when an emergency baby quilt is needed! 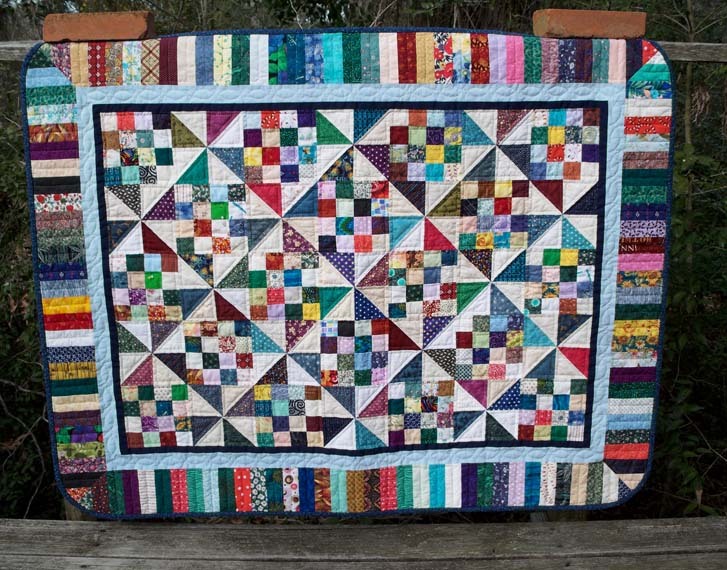 Late last night, I visited Bonnie K. Hunter’s Quiltville blog site and checked out her free patterns. I can ALWAYS locate a pattern there I want to make. There are so many to choose from it was a difficult choice. After narrowing it down to 3 patterns, this morning I made my final choice… Patches and Pinwheels. I’ve always loved this pattern! Tomorrow I’ll sort, iron, cut and assemble 17 pinwheel blocks. This is sooooo fast and fun using my 301a machine! Out of all my machines, I think I love her the most. Update 1/4/13: Yea! The top is done. It took a little longer than anticipated because I got sidetracked by making Wonky Star blocks. They looked like fun and I couldn’t resist. I have no clue what I’ll do with them. ANYWAY, the Patches ‘n Pinwheels top has a double frame of navy and light blue and a piano key border. 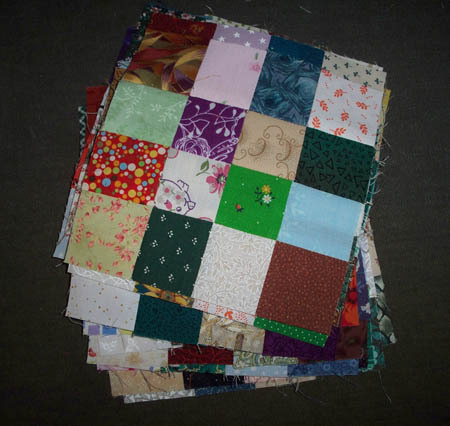 All these pieces and parts are leftovers from other quilts. Though I haven’t done it yet, I plan to round the corners. I found some dark blue with light blue mosaic fabric (looks like tiny chips of colored glass) which is perfect for the back. It’s in the washer now. I even have a piece of high loft batting that will work wonderfully. Tomorrow, I’ll start basting and will quilt in a hoop. The top measures 54″ x 42″. 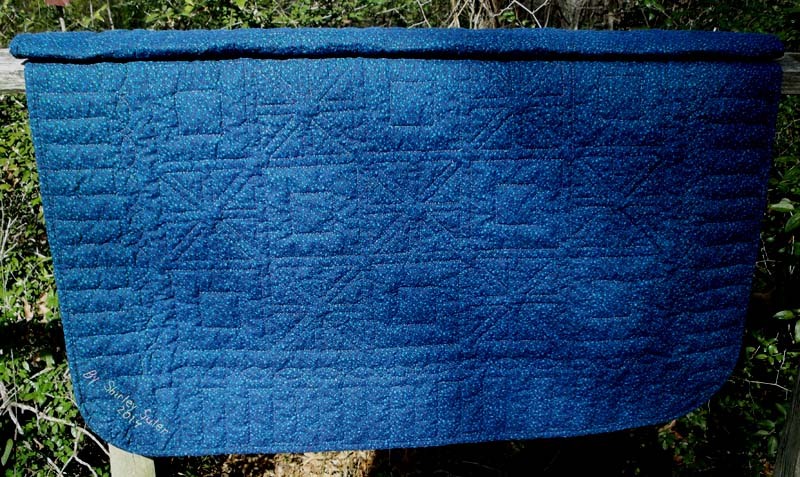 Update: 1/24/14 Finished, hand quilted, bound, labeled and laundered. Ready for gifting. Start to finish – 33 days.